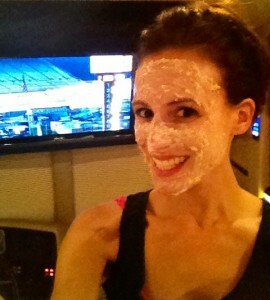 As some of you may have seen on Twitter last night I was making a homemade facemask while watching the truck race with Kyle in Pocono! I left all of my regular facemasks at home so I figured I would get creative with a homemade one of my own using natural ingredients I had on the motor home. The first thing I did was pop some red grapes into the freezer for twenty minutes. Then I sliced them in half and rubbed the inside of them all over my face. It is nice and cold and you can feel a tightening as it begins to dry. I read that grapes are also filled with alpha-hydroxy acids which are the ingredient found in anti-wrinkle creams. As this was drying I concocted my facemask. The first ingredient I used was a few tablespoons of oatmeal. Oatmeal is known to help soothe skin, improves its texture and give you an overall nice glow. 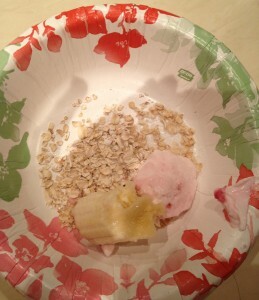 Next, I added a quarter of a mashed banana because it is known for its moisturizing properties. The next ingredient was Greek yogurt (strawberry it was all I had). Yogurt has lactic acid in it which can help to exfoliate and smooth the skin. I also added a small squirt of lemon juice because it is a natural clarifying agent. Finally I added a dash of sea salt which is said to help detox and regenerate the skin and it is also shown to help breakouts so I figured it couldn’t hurt to put a little in. I mixed it all together but I think next time I would toss it in a food processor, or in my case, my trusty Magic Bullet because it was very thick. I also put it in the microwave for 30 seconds just because I didn’t want to put on a chilly facemask. Trust me it didn’t look pretty but it smelled great! I let it set for about 20 minutes and then rinsed it off with cool water. I was pleasantly surprised by how soft and glowing my skin was! My face was hydrated but not oily. I am very impressed with this quick, easy and inexpensive facemask and I will definitely use it again!